Discussion in 'Shock Brother's DIY Amps' started by timfred, Feb 10, 2019. 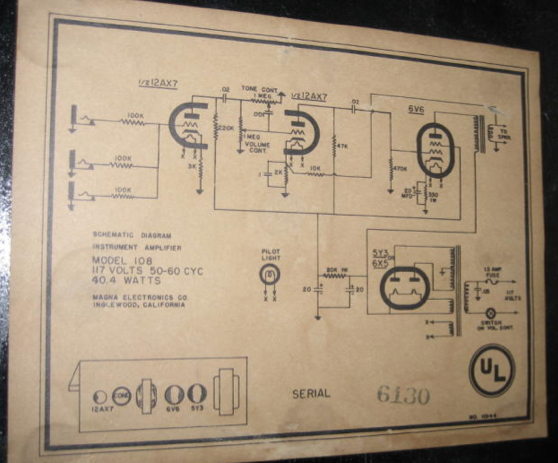 The original circuit is here (thanks to the Magnatone amps pages). It sounded nice, but with the tone control and heavy NFB it was way too clean. I mean, who needs a small clean amp? So my apologies to Mangatone amp lovers, but I started modding it. Nothing I've done is irreversible, so it can always be returned to original form (except for solder). It has a more overdrive than before - it starts breaking up around halfway. Compared to other similar amps the distortion balance seems shifted more towards pre-amp than power amp. It's nice. Any worries or tips? What would you tweak? two-node vs. three-node power supply. I increased the first stage to 32uF, but looking at other similar amps from Fender, Gibson, Supro, etc they all have a three-node PS. Should I think about adding that? Why? Perhaps related to #3 - does the power amp screen voltage seem low to you? What does this do to the sound or reliability of the 6V6?